What a thrill it was to find copies of the New Zealand Herald in the Eva Air lounge at San Francisco Aiport on our way home to NZ last week. And an even greater thrill was to follow when I discovered the following reviews by Herald book editor Linda Herrick in the excellent Canvas magazine. My thanks to Linda Herrick for giving me permission to reproduce her reviews on Beatties Book Blog. Judith Jones is the remarkable woman who first published Julia Child's Mastering the Art of French Cooking in America. 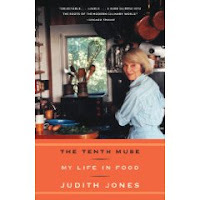 Senior editor and vice-president of Alfred A. Knopf publishers, where she has worked since 1957, Jones also maintains a lively blog (judithjonescooks.com) in which she encourages people to combine and extend their love of reading and food. This is a beautiful memoir which opens with a question her mother, in her 90s at the time, asked her: "Tell me, Judith, do you really like garlic?" Of course, the answer was yes. But her mother did not and Jones had been brought up in a household where garlic was banned and food smells banished. Nevertheless, Jones grew up interested in food and cooking and when she first went to Paris in 1948, she hit gold. She stayed, working as a cook, writer and editor (she recommended the publication of Anne Frank's Diary), before returning to New York where she joined Knopf and promoted writers such as Elizabeth David, M.F.K. Fisher, Claudia Roden and James Beard. But the big discovery, and the person who became her great friend, was Child. A charming read, ending with a generous selection of recipes. A treasure trove collection highly recommended not least for the wit of its writers and its clever, deadpan cartoons which immediately say: The New Yorker. In his introduction, David Remnick, who has edited the magazine since 1998, explains how his predecessors first brought food writing into the mix back in the 1930s with A.J. Liebling, a gourmand who died at the age of 59. His obituary noted that he once said, "I used to be shy about ordering a steak after I had eaten a steak sandwich, but I got used to it." The book, which runs at nearly 600 pages, is divided into sections: Dining Out, Eating In, Fishing and Foraging, Local Delicacies, The Pour (mainly about alcohol but ending with a piece by Malcolm Gladwell on "The Ketchup Conundrum"), Tastes Funny, Small Plates, and a section devoted to fiction which opens with Taste by Roald Dahl, about a dinner party with a wine-snob guest, and ends eight stories later with a tale by Julian Barnes. Too many writers are included here to list them in full but the collection includes M.F.K. Fisher, Judith Thurman, Dorothy Parker, Ogden Nash, Nora Ephron, Woody Allen and Mark Singer. The bonus is the cartoons, the very essence of sarcasm. 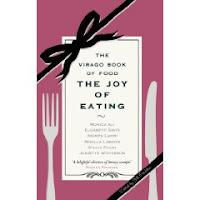 A collection of essays from the New York Times, this is a slimmer volume (200 pages) with Hesser's selection based on the relationship between food and memory. Her golden rule was "nothing sentimental". Unlike the New Yorker book, she also adds a note at the top of each story to give each writer context - a good idea. Many of us will meet new writers in the sections called Illusions, Discoveries, Struggles, Loss and Coming Home, but there are also well-known writers: Ann Patchett, Billy Collins (contributing a poem called The Fish), Julia Child with Alex Prud'homme, Kiran Desai and Pico Iyer. There are also quite a few recipes, including Child's one for Oeufs Mollets (coddled peeled eggs), a recipe which caused her grief during her diplome exam for the Cordon Bleu in Paris in 1951. After practising for months, Child was astonished to be handed a card asking her to write down the ingredients of three dishes, including Oeufs Mollets. She failed. Later that day, she writes, she went down to the basement kitchen and made all three, "whipped them all up in a cold, clean fury. Then I ate them". An all-womAn anthology of short fiction and non-fiction extracts. The first piece, by Banana Yoshimoto in a section called Kitchens, is just a couple of paragraphs long, and the snappy format throughout the book encourages dipping in and out. The range of writers is historic as well as contemporary, so it's a useful introduction to some more obscure authors. Contemporary writers include Monica Ali, Sarah Waters, Isabel Allende, Marlena de Blasi, Alice Thomas Ellis, Nigella Lawson and Amy Tan. New Zealander Peta Mathias is in there too, on the pleasure of sweets. Russian-born Milan-based Elena Kostioukovitch is a highly regarded translator whose work on Umberto Eco's The Name of the Rose earned top awards. Eco returns the favour by writing the foreword for this dense culinary exploration of Italy, top-to-toe. This is a full-immersion read with an almost total emphasis on words, rather than pictures, although the book is peppered with some black and white images. 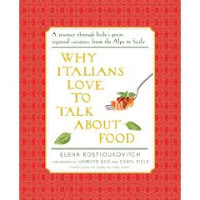 Eco explains that to explore Italy through Kostioukovitch's eyes is to venture through a country with "infinite gradations" in terms of geography, history, dialect, class and political struggles - all connected to cuisine. Her journey starts in the north-eastern region of Fruili Venezia Giula and the "sagra", the celebration of a dish or ingredient specific to an area. She includes a discussion of a fierce split in the Communist Party in the 1990s in which insults were hurled using a culinary code involving tortellini. To travel around Italy as a tourist is wonderful yet frustrating, because you will only scratch the surface. This book - which won Italy's Bancarella Award and Chiavari Literary Prize - goes deep, far and wide. Kostioukovitch writes about Sicily and the role of cassata (ricotta dessert) in the dark world of the mafia. She quotes from a prosecutor, who describes a dinner in which the cassata is brought to the table to be shared by an "unsuspecting designated victim." His mafia friends, "acting affectionately, without rancour, nothing personal for heaven's sake, choke off the last mouthful in his throat by tightening the noose around his neck". The chapter on totalitarianism and Mussolini's war on pasta, is just as fascinating. The Fascists believed pasta caused "lassitude, pessimism, nostalgic inactivity". Look where that got them. 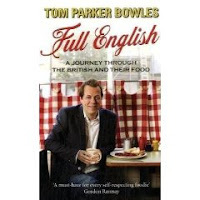 If you've watched Market Kitchen on the Food channel, you'll know that Tom Parker Bowles (Prince Charles' stepson) is one of its regular hosts, an affable food enthusiast who has written two well-received books, E Is For Eating and The Year Of Eating Dangerously. In this, his third effort, he travels through Britain in search of its traditional fare (black pudding, cheeses, ales, pies, fry-ups) and the characters who produce them in a fightback against supermarkets, mass production and processed food. The problem with British food, as many of us who have endured it know, is that a lot of it is awful - and many Brits have got into the habit of liking it. He quotes Martin Amis: "The French, they say, live to eat. The English, on the other hand, eat to die." Parker Bowles argues that "a new attitude has crept in" over the past 20 years. Conversely, the statistics for obesity and associated health problems are worsening and the production of processed food is booming. So Parker Bowles' search for the good stuff supports those plucky people trying to reintroduce individual endeavour and appreciation of "real food".